From Torontoist. Photos by David Hains. Variations of this line are repeated to me throughout the day, but I can’t say I ever need the reminder. It’s 7:15 a.m., and I’m on my way to participate in Fire Ops 101, a PR exercise in which politicians and journalists are invited to live like a firefighter for a day. 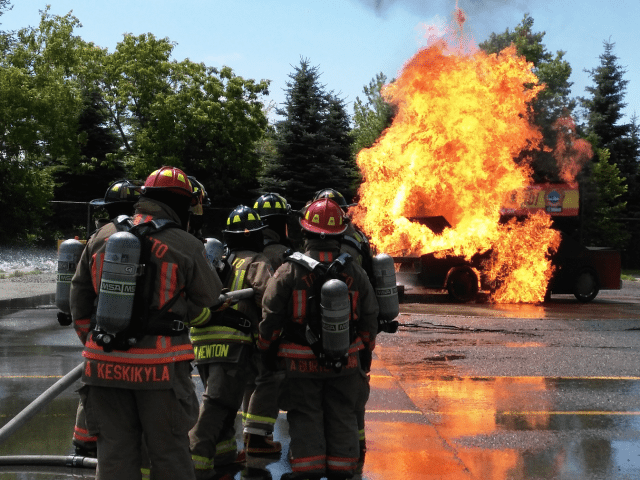 We’ll receive basic training, learn about the latest developments in the department, and put out a few fires along the way. I’m five-foot-two, I bench press 40 pounds on a good day, and I used to get anxious when an old roommate watched ER. Firefighting clearly isn’t in the cards for me, and so this is my only opportunity to live an irrational but long-held childhood dream. I barely slept the night before. As we make our way towards the east-end facility, I skim over the day’s agenda for the umpteenth time. Rather than list specific activities, we’re only told we’ll be performing four “Evolutions,” each followed by a 15-minute “Rehab” session. The euphemistic language makes me fear the worst, and my anxiety starts to flare up. Arriving at the training facility, I find that attendance skews heavily in favour of politicians over media types. City councillors include budget chief Gary Crawford (Ward 36, Scarborough Southwest) Joe Cressy (Ward 20, Trinity-Spadina), Sarah Doucette (Ward 13, Parkdale-High Park), and Mike Layton (Ward 19, Trinity-Spadina). By delightful happenstance—or someone’s sense of humour—my team includes Dan Jacobs, a former DJ-turned-Rob Ford’s executive assistant, and Rathika Sitsabaiesan, the NDP MP from Scarborough. Unsurprisingly, our conversation focuses heavily on the breakfast spread. I’m also matched with Bernd, my designated handler from the Toronto Fire Department. Like everyone else I meet from the department, Bernd speaks through a wide smile in short, declarative sentences, uses levelled tones, and maintains unbroken eye contact. At first it’s slightly unnerving, until I remember that for firefighters, clear communication is a matter of life and death. Bernd starts the day off treating me with a respectful distance, asking polite questions and directing me to the locations of the women’s bathrooms. But by mid-morning, it’s clear that my exuberance has now earned me the role of Scrappy Niece. He takes to calling himself my “personal Sherpa,” and congratulates me with firm pats on the back and a “Great job, Kate!” after each Evolution. At the end of the day, he promises, I can keep the helmet if I want to. First, it’s time to suit up. Participants are given yellow-striped gear that contrasts against the real firefighters’ orange, but they really needn’t have bothered. The difference in body types between the groups is like that of the football team and the marching band. Amazingly, the department found me a bunker suit that actually somewhat fits. The full kit includes boots (two sizes too large), pants and suspenders, jacket, gloves, a neck protector, and the giant fireman helmet. Each piece is incredibly heavy, and that’s before the addition of a 50-pound oxygen tank. As the final step, I’m fitted with a face mask that connects to the tank. I put on the airtight mask, and quickly feel the shock of my lungs deflating. Since I have the instincts of a part-time writer, my response is to flail my arms and flash through life’s missed opportunities. It appears I tuned out during Bernd’s explanation, and missed the part about opening the mask to the tank. He quickly comes to the rescue, and patiently re-explains the procedure. First up is the indoor CPR “Evolution.” Firefighters are often the first responders to general emergency calls, and so they’re trained in many medical procedures. Dr. Michael Feldman, medical director of the Toronto EMS Special Operations Program, introduces the latest advances in the department’s CPR procedure. Thanks to a set of new defibrillators that rely on motion-capture technology (the same that’s found in a Nintendo Wii remote), Toronto EMS has seen full revivals of unresponsive patients rise from 4 per cent to 9 per cent. Over 130 lives have been saved as a result. “How much did these things cost?” asks Jacobs, Rob Ford’s EA. 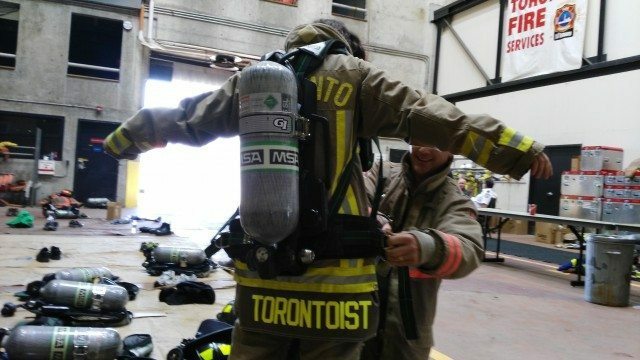 Five thousand dollars is the answer, though 150 were donated for the Toronto Fire Department’s participation in a study. So now it’s our turn to give these new defibrillators a try. The machines give specific directions to their users, telling us when we’re pumping too slowly or shallowly. CPR is administered in two-minute bursts, though it takes all of 45 seconds before I’m out of breath. “Good compressions!” say Bernd and the machine in unison. Next, we learn about the procedure for dealing with “entrapped persons,” or people who’ve been injured by a foreign object. The department has recently adopted a new system for such cases, where they attempt to separate the object rather than extricate it from the person. As such, each team is now equipped with a full toolbox of saws, pliers, and other assorted tools. The introduction of each item comes with its own anecdote: an eight-year-old boy who jumped off a roof onto a fence, a hand trapped in a meat grinder, a worker’s arm crushed under a factory’s steam roller. For my next mission, I’m supposed to go into a second floor apartment to execute a rescue. The mock apartment is located next to the wreckage of the car, and I’ve already seen several teams stagger out of its doors. Our mission is to ascend to the second floor with the fire hose, take turns putting out the blaze, and save anyone we find along the way. Bernd has told me repeatedly that visibility is the largest barrier firefighters face when entering a building, but it was hard to imagine the extent of it until I found myself in the tiny, smoke-filled space. I can barely see, and have to feel my way along the hose to stay with my team. When I reach the front of that hose, I’m struck dumb. An entire wall of the room I’m kneeling in is ablaze, and everything in my body is screaming at me to turn around and run. But some deeper part of me—the part that still enjoys fiddling with candles and staring into campfires—roots me to the ground. I pull back the handle on the hose, and douse the roaring flames. I’m simultaneously aware of my body—my arms are strained with the weight of the hose, and my knees feel the sharp pain of the concrete floor—and totally detached from it. All I can do is focus on the fire on front of me, and watch in awe as it dances under the stream of water. Bernd has to tap me on the arm to finally get me to stop. Besides providing sheltered writers and politicos with great dinner-party stories, these apartment rescue exercises are a hugely important part of a firefighter’s ongoing training. Preventable apartment-fire deaths are common in Toronto, as occupants often try to escape from burning buildings instead of waiting for emergency personnel in their protected rooms. Over the course of the day, three different firefighters relay the story of a couple who died in the stairwell of their building, succumbing to smoke inhalation while their abandoned apartment remained untouched. Public education campaigns are ongoing, but fighting thousands of years of human instinct is a major challenge. After putting out two more fires (a tanker, and the delightfully named “Car-B-Que”) it’s finally time to eat. I can’t remember the last time I felt so hungry. When my stomach growls, it feels like my entire body harmonizes with it. It’s over lunch that I get a clearer sense of the dynamics within a working fire department. Firefighters share close quarters during 24-hour shifts, which quickly establishes strong bonds between them. Alongside “Having fun yet?”, “We’re like a family” is the most repeated phrase of the day. Proximity is one thing, but shared experience is what truly unites firefighters. For many, gallows humour is important for building camaraderie and dealing with their often harrowing experiences as a group. But it’s still a shock for someone who doesn’t deal with these issues on a day-to-day basis. Our table is discussing subway jumpers, and how firefighters are often the first on-site responders. “If you can’t even kill yourself properly, I mean, what are you going to do next?” someone chimes in. After excusing myself for a coffee refill, I join Bernd’s conversation with an old colleague, a man who strongly resembles Mark Hamill gone slightly to seed. He travelled to the Philippines after their typhoon to train Filipino response workers, and would have gone to Nepal if he’d been given more than two days’ notice. We cover a lot of ground during our conversation, but he always brings the conversation back to fire. Fire not as a job title, but as a primordial force. It’s impossible for him to hide the thrill in his eyes. Maybe I have what it takes to be a firefighter after all.